Jeffrey Drazen and the Rattail | WhaleTimes, Inc.
How many kinds of (deep-sea) rattails are there? Which is your favorite species? Why? JD: There are about 400 species worldwide which is an amazing diversity. 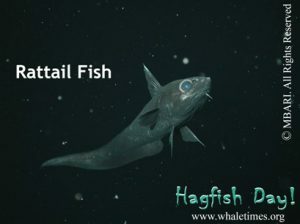 My favorite is probably the abyssal rattail (Coryphaenoides armatus). Its found worldwide from about 2000-4500m depth making it one of the most abundant fishes on the planet. Yet, much of its biology still remains a mystery. We have no idea when or where they reproduce. We have found no larvae. We do know now that they are big time scavengers eating lots of dead fish and squid that died in the surface and sank to the abyss. My what big eyes they have….why? JD: For rattail species that live down to about 3,281 ft (1000 m) they probably still see the last bits of sunlight. However, most species probably use their eyes to see bioluminescence – the light generated by other animals. This would allow them to hunt, avoid predators, and interact with others of their own kind. Some rattails have bioluminescent glands on their bellies, too. The rattail’s *pelvic fins look longer than most fish…is there a reason? 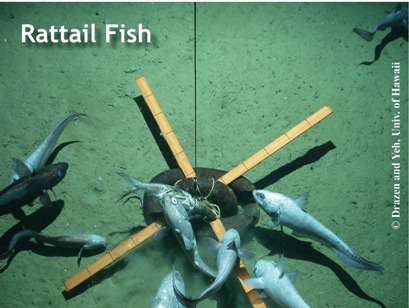 Most rattails (but certainly not all) swim along the seafloor looking for food. Their pelvic fins are long and covered in taste buds so that they can detect prey by skimming across the bottom. Pelvic fins are a pair of fins on underside or belly-side of the fish, sort centered between the head and tail. Pectoral fins are pair of fins closer to the eyes. Is it true that some rattails are big-time drummers? 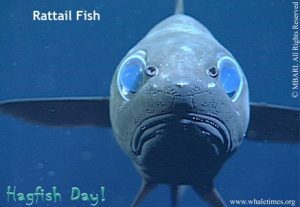 Can the deep-sea rattails drum, too? JD: Yes! In many species the males have special muscles attached to their gas bladders (the drum). They use these to drum, making noises probably to communicate to their own kind. This would be a great way to communicate in the dark. A rattail’s tail doesn’t look like a rat’s tail to me. (Say that three times fast!) tail. So, what’s up with the name? 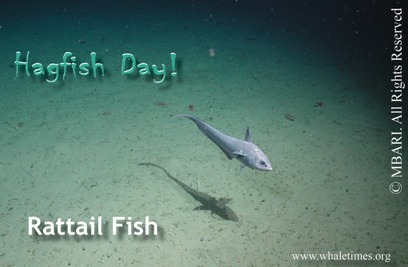 JD: A long time ago, scientists thought that the tail of these fish resembled a rat’s tail. This probably was in specimens captured in trawls so that all the scales were rubbed off. Their long tapering tails don’t allow for fantastic bursts of speed but they are very efficient slow swimmers. This is a big advantage for cruising in the darkness of the deep where food supply is really low. And, are they really called “grenadier” to make them more appetizing to people? Common names change. Fisheries began developing for these fish in the late 1970’s through to today. Nobody wants to eat a rattail. So they are now commonly called grenadiers. That sounds much more exotic and appetizing than rattail. JD: The large grenadiers that are commercially fished have a really slow pace of life and won’t be able to survive much fishing pressure. They have very low metabolisms and live a very long time — 50 to 75 years. They also mature late which means the do not reproduce until they’re somewhere between 10-20 years old! Grenadiers (rattails) also have have low numbers of offspring and probably only reproduce once every other year or so. All this information is important to understand because, the fisheries for grenadier/rattails are mostly principally trawl fisheries. Dragging a trawl net along the bottom of the ocean devastates the seafloor killing juveniles and adults alike. Is there a safe way to fish for rattails (grenadier)? JD: Probably not. 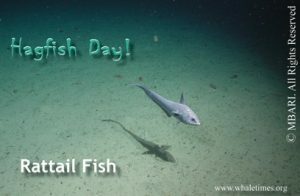 Where biologists have been able to collect good data about rattails, the fisheries for these species are not sustainable. That means the fish could not keep up with the fishing industry. Fishing for them could cause a collapse in their population. Two of our other Hagfish Day, the hairy vent snail and black snail, live in deep-sea vents. Would a ratfish ever run across them in its travels? JD: They certainly come through vent fields but I’ve not heard of them actually feeding on vent fauna. Why is the rattail important to its environment? JD: These fishes are relatively abundant, very diverse and often amongst the top predators in the deep-sea, the largest ecosystem on our planet. Can you imagine understanding how the African plains ecosystem worked without knowing anything about lions, cheetahs or hyenas? Can people….okay deep-sea scientists…observe them in person on a deep-sea sub or do they live too deep or are they shy? JD: We frequently see rattails from the sub. They aren’t very fast swimmers. You can see how close from the photos (on this page) of rattails taken from the sub. Some species do seem to avoid lights (shallower living ones) and others seem attracted to disturbance. In one experiment I was involved with off Monterey we had rattails swimming around the area the whole time we were taking sediment cores, or moving instruments about. We actually bumped into a few of them before they swam off. What don’t you know about rattails but hope to learn in your research? Another of my science goal’s is to understand life in the oceans deepest places, the ocean trenches. Rattails are some of the deepest living fishes in the world. They live just over 22,967 ft (7000 m) down! Why aren’t they found even deeper? This may have to do with food supply or with adaptations to crushing pressure. JD: Different species have different strategies or behaviors here are a couple. >The abyssal rattail has a very fat rich liver which it can use to live off of between meals. It has been calculated that it can live for about 200 days without eating. They are amazing scavengers and show up to bait within minutes even though they are not very abundant at any one location. They can do this because of their amazing sense of smell. (this is very similar to hagfish).